from 3 pcs. 15,07 EUR ea. from 10 pcs. 13,58 EUR ea. from 20 pcs. 12,81 EUR ea. from 40 pcs. 12,18 EUR ea. This photo rope guarantees a stylish presentation of photos and postcards. 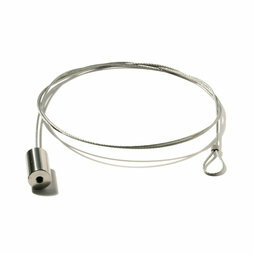 A heavy and sturdy steel weight keeps the 2 mm thick steel rope perpendicular. With the 15 enclosed super magnets you can attach postcards and photos steadfast without damaging them. This photo rope is made of high-quality material and is produced for us in Switzerland by the sheltered workshop Murghof. 1 pc. 20,27 EUR ea. That's the photo rope in full length. A massive steel weight makes sure that the rope is always firm and perpendicular. The weight is made of high-quality and stainless machine steel and weighs about 80 gramme. The photo rope and the magnets will be delivered in a simple and transparent plastic box. The magnets are small and inconspicuous. Photos, postcards, family pictures, passport pictures, notes, recipes,... everything can be hung up and taken down again in seconds. A gift that might look modest at first, but one that will be looked at a lot and that can be enjoyed for years to come.